Ozone is an air pollutant that negatively affects photosynthesis in woody plants. Previous studies suggested that ozone-induced reduction in photosynthetic rates is mainly attributable to a decrease of maximum carboxylation rate (Vcmax) and/or maximum electron transport rate (Jmax) estimated from response of net photosynthetic rate (A) to intercellular CO2 concentration (Ci) (A/Ci curve) assuming that mesophyll conductance for CO2 diffusion (gm) is infinite. Although it is known that Ci-based Vcmax and Jmax are potentially influenced by gm, its contribution to ozone responses in Ci-based Vcmax and Jmax is still unclear. 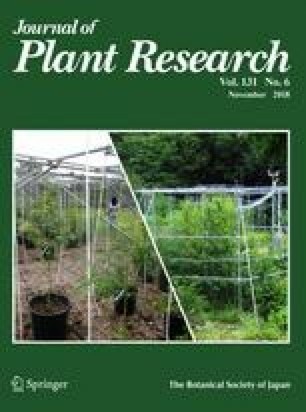 In the present study, therefore, we analysed photosynthetic processes including gm in leaves of Siebold’s beech (Fagus crenata) seedlings grown under three levels of ozone (charcoal-filtered air or ozone at 1.0- or 1.5-times ambient concentration) for two growing seasons in 2016–2017. Leaf gas exchange and chlorophyll fluorescence were simultaneously measured in July and September of the second growing season. We determined the A, stomatal conductance to water vapor and gm, and analysed A/Ci curve and A/Cc curve (Cc: chloroplast CO2 concentration). We also determined the Rubisco and chlorophyll contents in leaves. In September, ozone significantly decreased Ci-based Vcmax. At the same time, ozone decreased gm, whereas there was no significant effect of ozone on Cc-based Vcmax or the contents of Rubisco and chlorophyll in leaves. These results suggest that ozone-induced reduction in Ci-based Vcmax is a result of the decrease in gm rather than in carboxylation capacity. The decrease in gm by elevated ozone was offset by an increase in Ci, and Cc did not differ depending on ozone treatment. Since Cc-based Vcmax was also similar, A was not changed by elevated ozone. We conclude that gm is an important factor for reduction in Ci-based Vcmax of Siebold’s beech under elevated ozone. The authors are greatly indebted to Dr. Kazuhide Matsuda and Mr. Hiroyuki Ozawa (Tokyo University of Agriculture and Technology) for their technical support. The authors would like to thank the editor and two anonymous reviewers for providing valuable comments on an earlier version of the manuscript. This study was supported by JSPS KAKENHI, Young Scientists B (15K16136 to MW), Type B (18H03410 to TI and MW) and Challenging Exploratory Research (15K12217 to TI and MW).